2017 Parish Calendars have arrived — $10. Both English only and English+Russian versions are available. Work bee this weekend: We need your help! Friday: 6:30 pm. Start installing, finish cleaning any uncleaned chandeliers — 4 or 5 people could be used — some for cleaning, some for chandeliers, and other people can do other work in the basement. Saturday: 10am — till approx. 2pm Continue hanging chandeliers — 2 or 3 people needed; if there are more people, then there is extra work to do. Work will need to be done at Church on Friday night (6 pm) to prepare the Temple for the funeral. If you would like to come and help, please contact Reuben. Work bee: Sat Nov 5, 3 pm (cleaning, covering windows, installing chandelier, etc). Please contact Reuben if you have any questions. We need a couple of hair dryers for installing the window plastic covers. Please pray for all affected by Hurricane Matthew. While the current forecasted track has the storm staying away from us, check forecasts for updates (weather.gc.ca). Should the situation change, check for updates to the service schedule before leaving for church. For all those who are travelling this long weekend — stay safe! This does not mean that the Council is “fixed”. Other members may be nominated from the floor either for one of the official positions or as an additional member. Please remember to ratify your membership in the parish, as only supporting members of the parish are eligible to vote. Printed copies of the membership form are available at church. Please return completed forms to Allison. Current members need only complete page 1 unless contact information has changed. Please be assured all information is kept confidential. Work bee at the monastery: There is a work bee planned Sat Sept 24 at the monastery. There’s lots of work to do. If you can come, arrive when you can and you’ll be put to work. To make things easier on the monks, please bring your own lunch (no meat products). Contact Reuben if you need more information. Please continue to pray for Fr. Cassian and Fr. Vladimir as they recover from illness and injury. Please pray for Hieromonk Cassian. He suffered a heart attack last week, he then had another one on Sunday. His recovery will take some time. Please also pray for Fr Vladimir as he continues to recover from a bad fall. Sunday July 31: starting at 10:30 am — Hours, Divine Liturgy, and potluck picnic at Fr. Vladimir’s house chapel in Pinehurst, just outside of New Germany. Address: 3448 Highway 10. Please contact Reuben and he’ll try to find you a lift. Happy Fathers Day to all the dads of our parish! May God grant you many years! Christ is Risen! ... Indeed He is Risen! Work bee: 3:00 pm — volunteers are needed to help put the altar area and other things in church back in order after the renovations to be able to have services. Yard work, including mowing the lawn is also needed. Please come help if you can. Bookkeeper needed: Our parish needs a bookkeeper. No previous experience necessary. If you can help with this important task, please speak to Reuben. Our archbishop Irenee will be visiting the Antiochian parish of St. Antonios this coming weekend to celebrate the installation of a new iconostasis. On the occasion of archbishop Irenee’s visit, and because of repairs currently in progress at St. Vladimir’s, we are all invited to join St. Antonios for the services. Please note that there will be no services at St. Vladimir’s this weekend. Work Bee this Sunday, May 29: 1:30pm to Evening. 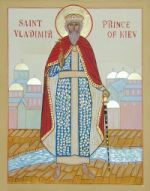 To prepare St. Vladimir’s for the new iconostas. This is a big project and many able bodies are needed. This will take the entire afternoon. To help with yard work (mowing and flower beds). To bring food and refreshments for volunteers. Thank you to all who made the services of Holy Week and Pascha possible: our priests, subdeacons, choir, and all those who helped with clean up, set up and decorating. It’s a lot of work. Thanks also to Olha and all the kids in Sunday School who dyed eggs to give out. Thank you as well to all who helped with the takedown, packing and transporting of the items that St Antonios parish has been so kind to give us. Appreciation is also due to those that provided our workers with lunch. By now we are all aware of the terrible catastrophe which has struck our brothers and sisters in Alberta. The wild fires in and around Fort McMurray are raging and continuing to spread. Thousands of people have lost their homes and everything which they had. Countless numbers have been forced to flee, the flight itself being very dangerous. Many will have absolutely nothing to return to when this horror finally ends. And what will be the cost in human life? The overall impact of this catastrophe cannot be measured in any terms. Surely we cannot say that it is not our concern, although I know that somewhere there will be those who will think that very thing. There is a simple answer to this situation, although this answer can never come close to undoing all the damage that has been done. The answer is this: Christ is Risen and has brought the Kingdom of G-d as a reality into our lives. Christ’s Resurrection has transformed all of us, even though we may not be aware of it. The greatest indication of Christ’s transforming power is the degree of the love and compassion He has increased in us. Now we have the duty — not only the duty — but rather the privilege of reaching out to those who have been so strongly affected by this terrible event. We must be ready at this time to come forward with the greatest response we can give. Even the smallest of donations will be of help, but let us be careful not to stop there. So often people will say, “It is not the amount of the gift that matters; it is the thought.” That, of course is true, and so we must see to it that the thought is in proportion to what Christ has done in and for us and in proportion to the creative and supportive love of G-d. I ask you all, please do not skimp, but give to the best of your ability to help our fellow human beings, our fellow Christians, and brothers and sisters in the Risen Christ. We all have enjoyed G-d’s blessings. Now it is time for us to increase those blessings to others, and in so doing we will bring more blessings and joy into our own hearts. Money will be needed in Alberta for a long time, so there is no need to be hasty. Let each one of us think, consider, and — most importantly — pray, so that we may determine the extent to which we can help. And when we do decide, let us not satisfy our selves by giving a small token amount. Please, open your hearts and give generously, in compassion, love, and in the presence of the Risen Christ. Let us set aside three weeks from this weekend. At that time — or before — please give your offerings to St. Vladimir’s, clearly marked for the wildfire disaster, and the donations will be forwarded to an appropriate destination. Work Bee — We need your help! Your help is needed moving items from St. Antonios to St. Vladimir’s. There will be a light lunch served. For the Christian, the beautifying of the Temple is always a joyful task. It is not that G-d needs or demands a beautiful temple, but we need joyfully to express our thanksgiving and adoration to Him. A temple adorned and made beautiful is a way of expressing our witness to the reality and love of G-d and of the Risen Christ. We are especially blessed by the generous gifts which the parish of St. Antonios is offering to us, and these will be a tremendous improvement to our place of worship. The labour involved in the moving and setting up of our new iconostasis and the other furnishings can be an excellent chance for us to express our devotion to and joy in the Risen Christ. Taking part in this work will be not a toil and burden, but a privilege. We are asking you, therefore, to please consider donating your time and effort this coming Saturday, May 7, to disassembling and moving the iconostasis and other furnishings from St. Antonios’ to St. Vladimir’s. The work will start at St. Antonios (2455 Windsor Street) at about 10:00 a.m. on Saturday morning, although the exact time will be confirmed later this week. Have a blessed and joyful Bright Week, keeping the Risen Christ always before the eyes of faith and in your hearts. Sun., Apr. 24: 6:00 p.m. — 7:00 p.m. Mon., Apr. 25: 6:00 p.m. — 7:00 p.m. Tue., Apr. 26: 6:00 p.m. — 7:00 p.m.
Wed., Apr. 27: 6:00 p.m. — 7:00 p.m. Thu., Apr. 28: 6:00 p.m. — 7:00 p.m.
Fri., Apr. 29: 1:00 p.m. — 2:00 p.m. Please make arrangements in advance. During the above dates Fr. Vladimir will be in Halifax and cannot be reached by his home phone. Please use either e-mail (vladimirmih (at) eastlink.ca) or his cell phone (902-483-7492). Holy Week flowers: We are collecting funds for flowers to decorate the church for Holy Friday and Pascha, if you wish to contribute please see Nancy or Elena. Sat Apr 16: Vespers 6:00 pm. Sat Apr 9: Vespers 6:00 pm. Sat Apr 2: Vespers 6:00 pm. Reminder: confessions heard Sat before Vespers by appointment, please contact Fr Vladimir at 902-543-1760 or by email no later than Fri evening to schedule a time. By this coming Sunday, we shall be already two weeks into the Great Lent. In four more weeks we shall be at Palm Sunday, welcoming our Lord as he enters Jerusalem and begins the most sacred week of the year, the week wherein He begins His own Paschal journey and becomes our Passover Lamb. Hopefully we have all started to make some progress in our preparations to celebrate this event, the most important moment in the entire fourteen billion year history of the universe. There are no words to describe the magnitude and significance of our Lord’s Paschal offering of Himself, but we must strive to do our utmost to approach it with reverence, fear, and joy. We can see some of that in the Gospel which will be proclaimed on Sunday. The crowds who came to hear our Lord’s words were so eager and anxious that they blocked the way to Him. No one could get through them. And who could have blamed them? They had this incredible opportunity, and they were quick and ready to take advantage of it. But then there were the men who were bringing the lame man to be cured. There was no way they could manage to come to Jesus. It would have been understood if they had said, “Well, maybe another time we can manage.” But they did not. They persisted to the point of opening a hole in the roof of the house and lowering the lame man down. That was a pretty drastic and bold measure. Did they even think about what they were doing? Probably not. They only knew that they had to come directly before Jesus, and their perseverance was such that they were determined not to fail. Printed copies of the full Lenten schedule available at church. You are strongly encouraged to attend as many of the Lenten services as possible. During the Great Lent, the Liturgy is normally not served on weekdays, except for on the Annunciation. This custom of abstaining from daily celebrations of the Liturgy is an integral part of the Lenten Fast; not only do we fast from food and some other aspects of life, but we fast also from the spiritual nourishment given to us in the sacrament. This is not so much a deprivation as it is an encouragement to us to strive even harder to develop our spiritual life using our own resources. Being obliged to do without the sacrament throughout the week should also help us all the more to appreciate the great grace which our Lord gives us in the bread and wine which become for us His body and blood. At the same time, it is assumed that people are keeping the fact, may be experiencing some weaknesses and difficulties, and may be in need of extra strength from the sacrament. Therefore, the Presanctified is offered, not as a celebration of the Liturgy, but as Vespers in which the Sunday Liturgy is extended to us so as to bring us the strength of the sacrament which was available on the previous Sunday. This is a special grace and concession which is made to our weakness, and so we should be thankful for this opportinity which is given to us, not as a right, but as a great privilege. The Presanctified is thus not simply a Lenten service observed solely because we are in Lent. We do not attend it as an extra a way of marking Lent. The Presanctified is, in a very real way, an opportunity for refreshment, a means of softening the austerity of the Great Lent. We can take this opportunity to attend the Presanctified in order the avail ourselves of the extraordinary — “extra-ordinary,” that is, in the literal sense of the word — grace of receiving our Lord beyond what would normally be our due. In this regard, the Presanctified is a very special grace, one for which we should be thankful and which we should recognize as a place of rest and refreshment in the journey of Great Lent. It can be also for us a foretaste of the great joy which is to come in the Pascha, the Resurrection of our Lord Jesus Christ and the opening of the gates to eternal life. Sat Mar 12: Vespers 6:00 pm. Note as previously announced, Fr Vladimir will be hearing confessions before Vespers, if you wish to book a time, please contact him at home (902-543-1760) by this evening at the latest. Looking to learn more about Great Lent — there are resources available at www.oca.org, and podcasts of sermons at www.ancientfaith.com. Sun Feb 21: Hours, Liturgy, coffee hour 10:00 am. Happy news — we have a new parishioner! Pavlo and Anna have a baby girl Solomiya, delivered Sun evening. May God grant them many years! Sun Feb 14: Hours, Liturgy, coffee hour 10:00 am. Please attend these services if you can, as this is one of the great feasts of the Church, to learn more about the meaning of the feast, see this link. Fun festal trivia fact: the blessing of the candles is why in English this feast is often referred to as Candlemas. Lent is approaching, this weekend will be Zacchaeus Sunday, followed by the 4 preparatory Sundays before Lent. Confession can help prepare us for the Lenten season. To schedule a confession, please contact Fr Vladimir. Sun Feb 7: Hours, Liturgy, coffee hour 10:00 am. Lent is approaching, next weekend will be Zacchaeus Sunday, followed by the 4 preparatory Sundays before Lent. Confession can help prepare us for the Lenten season. To schedule a confession, please contact Fr Vladimir. Sun Jan 31: Hours, Liturgy, coffee hour 10:00 am. Sun Jan 24: Hours, Liturgy, Blessing of the waters, coffee hour 10:00 am. Fr Alexander will serve and preach the sermon. If you wish to take holy water home with you, please bring a very clean container (that has preferably been soaked in very hot and soapy water) to prevent any contamination. If you wish to view photos of last weekend’s events, please click here. News from the monastery: Father Roman has received the Great Schema, and has taken the name of Luke, after St Luke of Simferopol. May God grant Father Luke many years! Many years to our newly-ordained priest Alexander and subdeacon Pavlo! Please remember them and their families in your prayers as they take on new responsibilities in the Church. Many thanks to all who helped organize food, helped in the services, chauffeured visitors, shovelled and sanded the front of the church and performed many other tasks needed to have the weekend run smoothly! Archbishop Ire’ne’e has given us the blessing to serve Vespers with the blessing of the waters on Monday at 6:00 pm for the eve of Theophany. For those who can’t make it, there will be another blessing of the waters Sunday. Sunday, January 17: 10:00 am Hours and Divine Liturgy with ordination of Deacon Alexander to the priesthood and ordination of Pavlo Slavinskyi to the subdiaconate. Please keep Fr Deacon Alexander and Pavlo in your prayers as they prepare for this. 1:30 pm — Potluck reception after the Liturgy at the Purcell’s Cove Social Club, 505 Purcell’s Cove Rd., Halifax. Contributions of food and drink to both potlucks would be very much appreciated. For further information on the potlucks and on how you can help, please contact Ksenia. After the service there will be a potluck meal downstairs, please bring contributions of fish, meat, cold cuts, salads, cheese, wine and drinks and the like. If the parking lot is full, please park on Fergusons Cove Road, no snow is currently forecast, so we should be ok to park on the street. The following day, Thursday Jan 7, all are invited for a potluck meal at the house of Reuben Penner to continue celebrating in the joy of the feast starting 3PM with coffee, tea (meal will be at 5:30pm). Please bring a dish to contribute.